If you have chosen to stay in one of the many Monterey hotels, resorts, and inns, you have chosen well! Monterey is located near the center of everything. If you want to spend your time to explore the tiny hamlet of Carmel by the Sea, then your right next door. 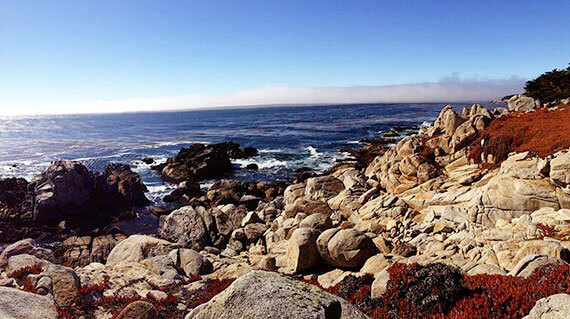 The world famous Seventeen Mile Drive, where you can relax to the sound of the ocean, and Monterey Bay Aquarium are only a few minutes away. I have listed what I think are among the best in all categories when everything is considered. Monterey has wonderful resorts, inns hotels and motels, and there are ample choices for all preferences and all budgets. Websites like this one, are better when you share your travel stories! Tell us about the best places where you have stayed, about those unique unplanned discoveries, or about that fantastic beach where there were no crowds. You are invited to join our blog and add your own reviews, your own interesting photos (limit 4 images link) and experiences so everyone can benefit from your travels. One of the newest and most interesting Monterey resorts is the Sanctuary Beach Resort. It's actually in Marina, a few miles north of Monterey, but included it because it is nearby and I think a unique and special destination. Located right off Highway1 in the city of Marina your away from crowds, and have immediate access to the beach and rolling waves. If you choose to stay here you'll be on the beach in minutes if not seconds. Make a quick selection from the well stocked mini bar in your room and walk right out onto the beach. If at all possible, book an ocean view or ocean front room so you have clear view of the ocean. Since this is a new development and there are no trees, you'll want to have an unobstructed view of the water and not your neighbors patio. The rooms at the Sanctuary Resort are well appointed, have upscale linens, fireplaces, flat screen TV's, free wireless internet...even binoculars. After walking and relaxing on the beach come home to dinner at the Kula Ranch Restaurant enjoy cocktail's at sunset. Try the Japanese sand dabs for an interesting change of pace. This is a place for those who just want to relax and don't need or want to drive to nightclubs or to where all of the activity lies. My choice would be to stay here and then drive the 20 minutes (I timed it) to Carmel's Ocean Avenue restaurants. You might even try my favorite the Portebello or Anton Michele's. I know your not particularly interested in going into town but maybe you'll follow my advice just once. Carmel is charming, romantic and is easy to get to and is easy to return back home. Just take Highway1 from the resort and make the short hop to Ocean Avenue right off Highway. Park your car near Ocean and San Carlos and your very close to both restaurants. The Monterey Plaza Hotel and Spa is consistently rated among the best of all Monterey hotels. This Monterey hotel accommodation is located right on the water and not far from Cannery Row and the Monterey Bay Aquarium. Rooms either face the street side or the bay side. This is no time to save a few dollars. Book a room on the Monterey Bay side and ask for a patio. After you arrive waste no time finding that patio chair and begin to listen to all of the sights and sounds of the ocean. Trust me you will be glad you did. This is what you came to Monterey for, so my advice if you can, is don't try to save a few dollars here. You are creating a memory that you will recall it favorably for years to come... the sounds of crashing waves, seagulls and the relaxing effect of being on the water will make this a great choice. If I'm wrong, I mean seriously, if you think it was really a bad idea, let me know on my blog and I will publicly acknowledge your experience. There is also a good sized spa on the hotel deck overlooking the ocean. For lunch, try Schooners Coastal Kitchen in the hotels outdoor restaurant location. The last time I was there, I really enjoyed the Clam Chowder sourdough bread bowl and it was only seven dollars but the view was worth a million! The Spindrift Hotel in Monterey is probably one of the best Monterey hotels you can stay in if you like ocean front proximity, European inspired furnishing and immediate access to Cannery Row. The rooms have real wood fireplaces, window seats, and wingback chairs. Most have canopy beds and feather bed coverlets so your comfort is assured. Service here is impeccable. Friendly and helpful. Hotel Abrego is closer to downtown Monterey, but is only 1 mile to Fisherman's Wharf and 2 miles to Cannery Row. Rooms are on the smaller side, but have fireplaces and flat screen TVs's. This hotel is always rated among the top 5 hotels in Monterey. Staff is friendly and you can save a few dollars, but have to take a car to get around to most local attractions. The Clement Intercontinental is another of the newer hotels on Cannery Row. Many of these Monterey hotel rooms have an ocean view. Ask for a room on the ocean side to avoid street noise. Parking is extra and requires a little walk. Rooms at the Intercontinental are larger than most and furnishings are of a more modern design than other upscale lodging in the area. Guests enjoy the availability of a spa and fitness room and the Monterey Bay Aquarium is right next door. If location is your primary objective this may be a good choice. For budget travelers or for those who choose to spend their dollars on good food or travels to day trip locations, the America's Best Stage Coach Lodge is a nice choice. This chain is known for it's lower priced rooms that are quiet and clean. As always along the central coast book early. If you travel in late May or in late September or early October, you can get the best of fabulous weather and seriously discounted room prices. While Monterey hotels and resorts are centrally located and perfect for access to much of what the California coast offers, be sure to check out other possibilities on this website. If your looking for more of a wild coast experience, read some of the reviews of what lies about 45 minutes south at Big Sur. You can still have the pampered elegance you require but if you want a little edge to your travels, Big Sur is a very interesting destination and one that should not be missed if you don't get here often. You can hike where green and blue vistas are around every corner, and where you can really experience deep and profound relaxation...and not just a typical vacation.